Yes it is back to school for me. My last post had a spelling mistake, sorry to the few who read this. Although I do have a few friends in certain places who are also good at mis spelling, you know who you are. 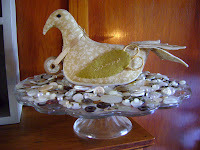 Here is a little birdie I made from the book Flower Bed Threads by Need'l Love. There are several books in this range and they are gorgeous. Hope your week is a sunny one where ever you are, I am up the top of the South Island for work and Will have my camera with me, so look out for some more shop pics. You have friends who can't spell???? Hmmmm wonder who that is!!! !